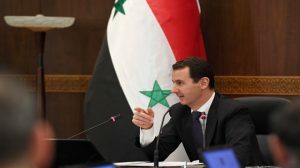 President Bashar al-Assad on Tuesday launched the National Project for Administrative Reform during his presiding over a Cabinet session at the Cabinet headquarters in Kafarsouseh area in Damascus. 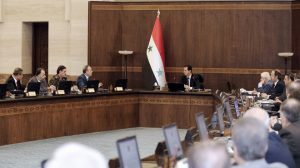 During the session, President al-Assad said that this project depends on several axes, the first of which is creating a unified and homogenous methodology for all ministries via a center called the Canter for Administrative Assessment and Support, which will devise structures and job classification, come up with mechanisms for assessing performance and internal systems of establishments, and assess procedures between citizens and establishments, between establishments, and within establishments, as well as measuring citizen and employee satisfaction and combating corruption. The project will also include the Administrative Performance Observatory which is mainly an electronic structure, one of whose tasks will be to follow up on how establishments implement the criteria set by the Center, eventually allowing for evaluating each establishment and make comparisons between establishments according to the development of their performance. Another part of the project is the Human Resources Service Center which is tasked with putting together a detailed and accurate map for available human resources as well as a map fir vacancies and linking them together through job classification, which will allow the government’s employment policy to be clear and methodical by relying on the two maps to fill vacancies with the suitable skills and qualifications. The Center will also provide electronic training to improve performance. President al-Assad pointed out that the project will also involve launching a website to communicate with citizens and receive their suggestions, complains, or evaluations regarding establishments, which will allow for having a more comprehensive process in which everybody participates instead of just remaining linked to ministries and their establishments. President al-Assad concluded by addressing some harmful phenomena that appeared during the last few years that directly infringe upon citizens’ rights and do not befit the country, including officials having large motorcades or cutting off roads, stressing that such things are unacceptable and instructing the ministries to take the necessary steps to curb such phenomena.